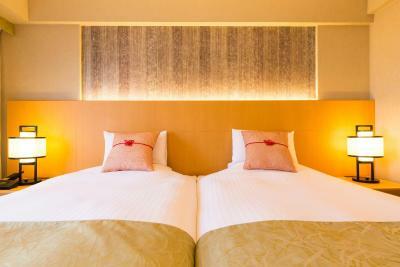 Lock in a great price for Kyoto Brighton Hotel – rated 8.9 by recent guests! Exceptionally helpful staff at the bell desk and concierge. 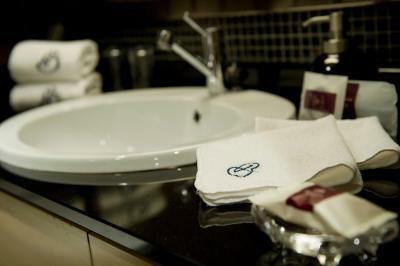 The room (luxury double) was very large and had a wonderful shower and bath. It is close to Nijō Castle and Imperial Palace. Around the corner there is an excellent izakaya fornlate night drinking and eating. Our room was spacious and had a seating area which we used with friends. 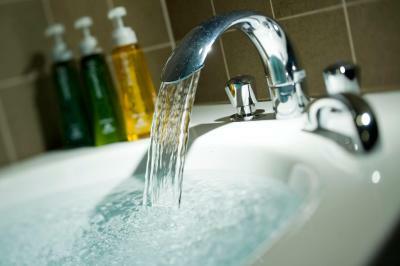 The bath and shower & toiletries are great, my only complaint is that the mattress was hard, like sleeping on the floor! I asked the staff for an extra comforter to use as padding on top the mattress and the bed was still difficult to sleep on. So, not much sleep & woke up achy! The staff went out of their way to help us as we looked for alternatives to the on-site restaurants. 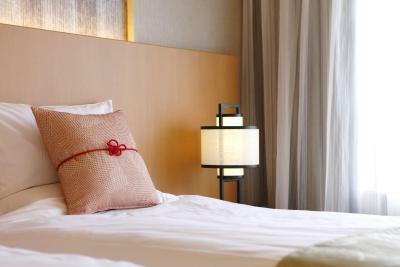 The rooms are very spacious, clean, and fully equipped with all that is needed to ensure a comfortable stay. Everything was perfect. Friendly staff, great food. Overall a great atmosphere. 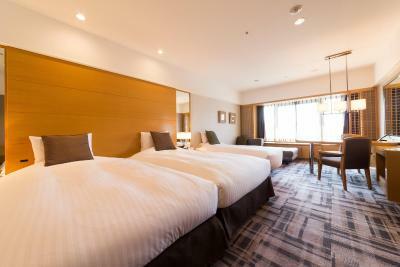 Shuttle bus, center of Kyoto, complimentaries, cleaning, big rooms. The hotel was located in the residence area , overlooking the Hills and just a walk away from.nearby locations for sightseeing. 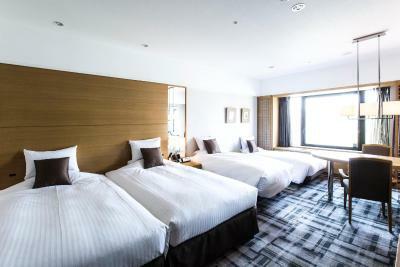 Kyoto Brighton Hotel This rating is a reflection of how the property compares to the industry standard when it comes to price, facilities and services available. It's based on a self-evaluation by the property. Use this rating to help choose your stay! 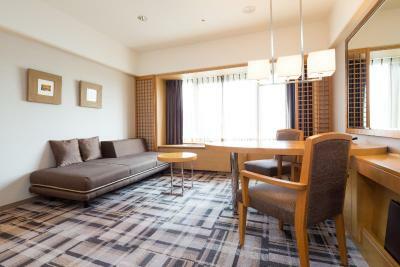 One of our top picks in Kyoto.Nestled in a quiet residential area, Kyoto Brighton Hotel is located in the heart of Kyoto, a 5-minute walk from Kyoto Imperial Palace. All guest rooms are nonsmoking and soundproofed. 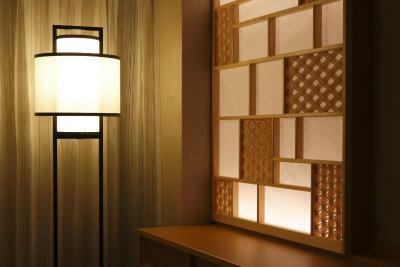 An air-purifier/humidifier and a matcha tea set are provided in each room for guests' comfort. 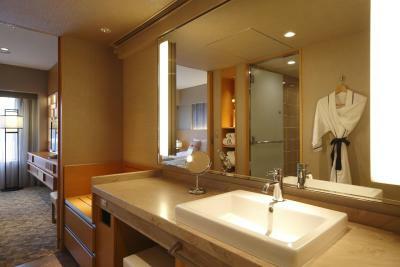 The bathroom comes with a deep bathtub where guests can relax after a long day. 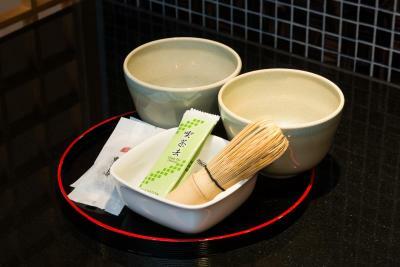 The hotel features 5 dining options where guests can enjoy carefully prepared meals with Japanese traditional techniques. A concierge service is provided, and free shuttle services are offered to/from Karasumaoike Subway Station every 20 minutes. 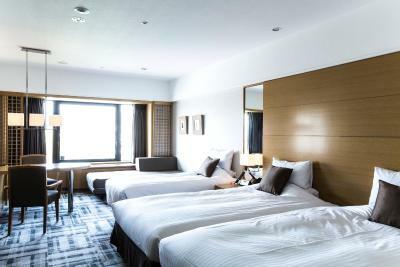 Kyoto Brighton Hotel has been awarded the Tripadvisor Certificate of Excellence since 2012, as well as TripAdvisor Travelers' Choice Award 2013 and 2018. 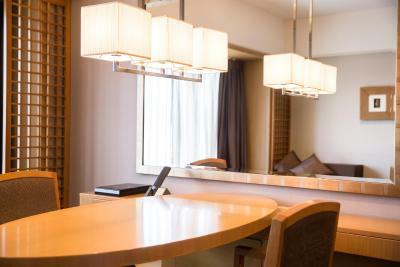 When would you like to stay at Kyoto Brighton Hotel? Elegant room featuring large windows and soft natural tones. Each room is fitted with a flat-screen TV and a mini-bar. 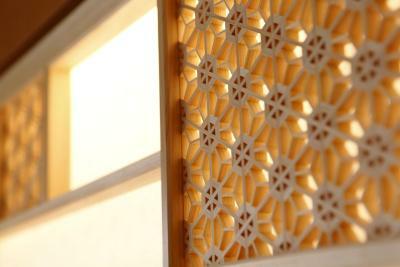 Windows can be opened. Spacious room in light natural colors, comfortably fitted with a sofa and a dining table. It comes with a flat-screen TV, a DVD player, a large bathtub and a rain shower. Wired internet is available for free. 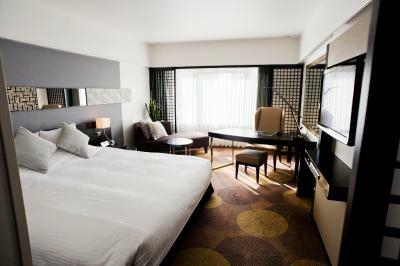 Spacious rooms on the 2nd-4th floors featuring large windows and soft natural tones. 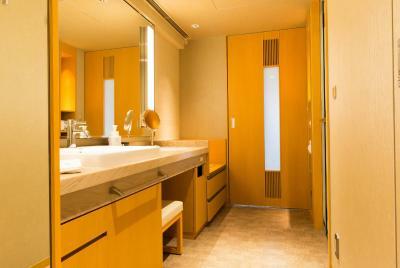 Each room is fitted with a flat-screen TV, a mini-bar, a large bathtub and a rain shower. The room has a sofa and a work desk. Windows can be opened. More spacious elegant room featuring large windows and soft natural tones. 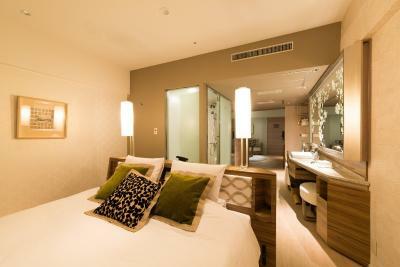 Each room is fitted with a flat-screen TV with DVD player and a mini-bar. Includes a dining table, sofa, a large bathtub and a rain shower. Windows can be opened. 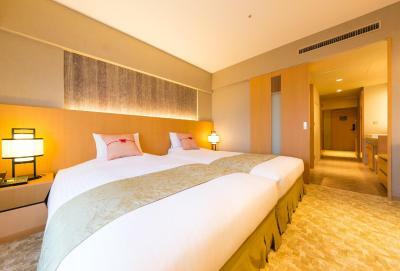 Renovated in February 2014, this very spacious room features a living room and a bed room, both decorated with a sophisticated Japanese decor and Kyoto motifs. It is fitted with a sofa and a dining table. It comes with a flat-screen TV, a DVD player, a large bathtub and a rain shower. Wired internet is available for free. 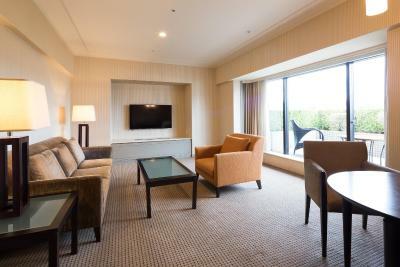 Very spacious room on the 4th and 5th floors featuring large windows and soft natural tones. 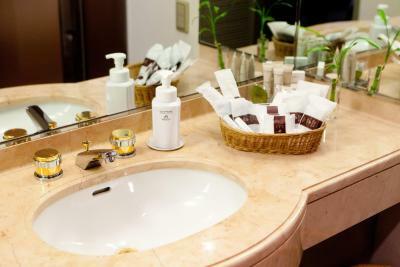 Each room is fitted with a flat-screen TV, complimentary specialty coffee, a mini-bar, a large bathtub and a rain shower. The room has a sofa and a work desk. Windows can be opened. Spacious room decorated with a sophisticated Japanese decor and Kyoto motifs featuring a living area with sofa and dining area. 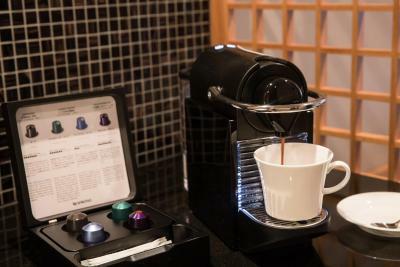 The room has large windows and soft natural tones and is fitted with a flat-screen TV, a DVD player, a complimentary espresso maker, a mini-bar, a large bathtub and a rain shower. Windows can be opened. 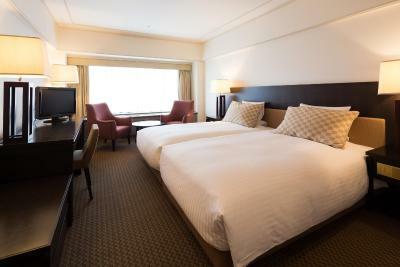 Spacious room on the 5th and 6th floors featuring large windows and soft natural tones. 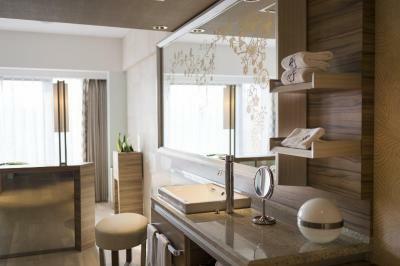 Each room is fitted with a flat-screen TV, complimentary coffee maker, a mini-bar, a large bathtub and a rain shower. The room has a sofa and a work desk. Windows can be opened. This double room has a mini-bar, dining area and tile/marble floor. This twin room has air conditioning, seating area and sofa. This triple room features a electric kettle, cable TV and air conditioning. 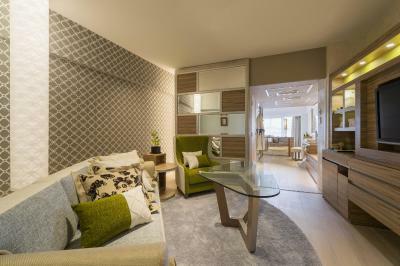 This quadruple room has a mini-bar, electric kettle and seating area. 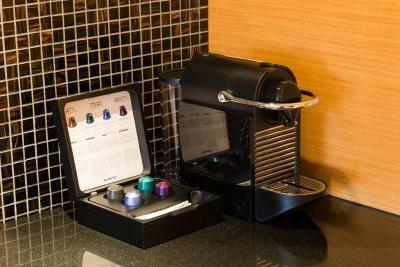 This suite has a mini-bar, cable TV and electric kettle. 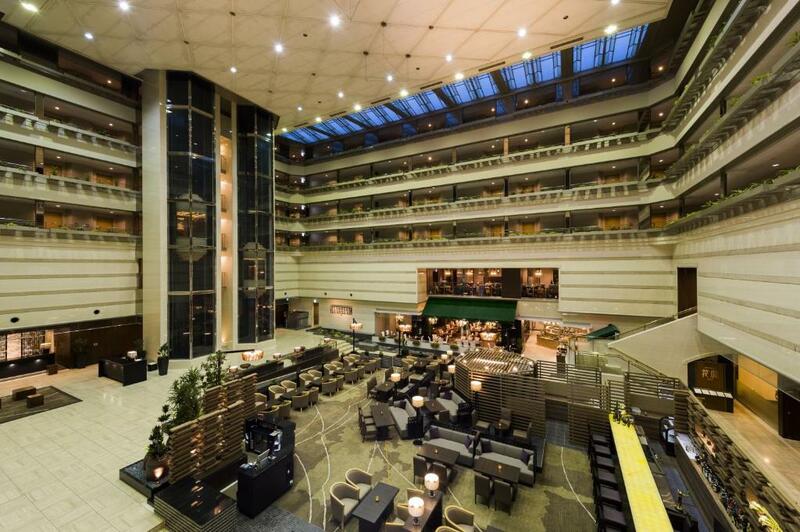 Hotel surroundings – This neighborhood is a great choice for travelers interested in city walks, architecture and history – Check location Good location – show map Guests loved walking around the neighborhood! 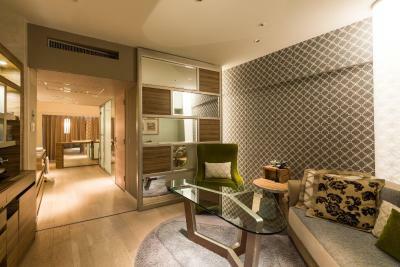 House Rules Kyoto Brighton Hotel takes special requests – add in the next step! 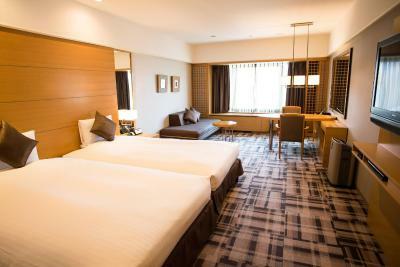 Any additional older children or adults are charged JPY 5940 per night for extra beds. Kyoto Brighton Hotel accepts these cards and reserves the right to temporarily hold an amount prior to arrival. Double Rooms cannot accommodate extra beds. This is a completely nonsmoking hotel. Smoking is not allowed inside the property and guests cannot request smoking rooms. The free shuttle is available from Karasumaoike Subway Station (near Exit 2) between 08:20 and 21:40. The shuttle leaves the hotel at 10, 30, and 50-minutes past the hour, and returns from the station on the hour, 20 and 40-minute past the hour. When booking 3 rooms or more, different policies and additional supplements may apply. Please contact the property directly for more details. Everything good , nice staff and nice restaurant. But bad lounge and bar . Some people may feel it is a bit away from city centre but it is at the same time located in a very quiet neighbourhood which will make you experience the heart of Kyoto. fairly good breakfast. We tried Japanese style and international style on different days. I will say the quality was well above average and nearly excellent. The duty manager 小田鳩 is again very useful and she is able to converse fluent English (native English speaker level). 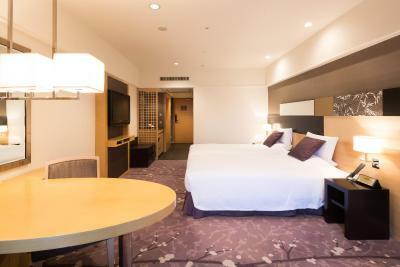 This is our second time with this hotel and we will choose here for our annual visit to Kyoto! No metro or bus station near by, but hotel provides free transport to nearest metro station which is good. Hotel was very good, rooms were very spacious, ambience was excellent. Location isn’t the best, was a long walk to the main areas of Kyoto. Also, room service was not available after 10pm - and there is no coffee in the room to make yourself. Amazing staff, they helped organise our day trip, my husband on crutches due to ski accident, everyone helped and supported him. Shuttle bus to town, and back, lots to see and do. Great location. I didn't like the location - there isn't much around there to see and everything seemed to be a fair walk away - yes i walked it - next time I would try and choose somewhere near the railway station as there was a lot more happening down that end of town. Staff, rooms, facilities, everything absolutely spot on. Best bathroom ever. I was really sad to have to leave. Great place, everything has been very nice, top-notch! The room and bathroom were spacious. Excellent bathtub and shower. 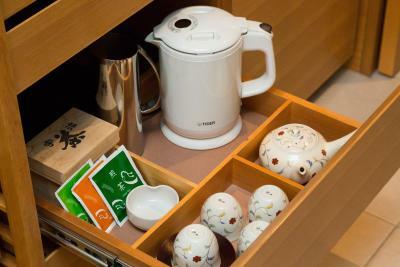 Loved the tea set and special green tea to have your own tea ceremony in your room. Breakfast options were varied and of good quality. Everything about the Brighton is always lovely.